We have secure, convenient payment options that allow you to pay who you want, how you want and when you want. If you love shopping online but hate having to enter your card number and shipping address every time, you need Visa Checkout. It’s easy to enroll, simple to use, and safe. So, next time you see the Visa Checkout logo, all you have to do is login and checkout! Visa Checkout is available from many different merchants, for the full list see Visa’s website. 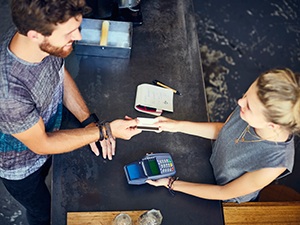 With our People Pay option, you can send funds to friends or family in as little as one business day electronically for a low fee of $0.50 per transaction. All you need is their email address or phone number, it’s that easy! Just sign in to online banking and visit the “Pay and Transfer” page or download our Mobile App today. Transfer funds to other financial institutions via wire transfer. Outgoing wires can be made at a Hillcrest Bank banking center. The cut-off times for wires is 3 pm (CT). Incoming wires must be received by 4 pm (CT) to receive credit on that business day. 1Apple, the Apple logo, iPhone, and Apple Watch are trademarks of Apple Inc., registered in the U.S. and other countries. Apple Pay and Touch ID are trademarks of Apple Inc. Requires app version 7.6 or above. 2Android, Google Pay and the Google logo are trademarks of Google Inc. Requires NFC- or HCE-enabled Android device running KitKat 4.4+. 3Samsung Pay and the Samsung Pay logo are trademarks of Samsung Electronics Co., Ltd. Requires app version 7.6 or above. 4Additional fees may apply. 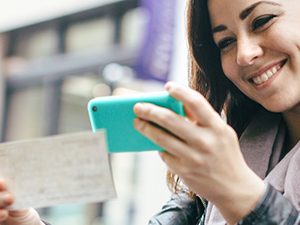 The perfect platforms designed to help you get the most out of your banking experience. Get direct access to your Hillcrest Bank checking account.